A Reluctant Foodie: Authentic Unbeatable Swedish Meatballs! 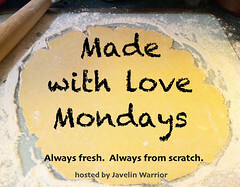 I am delighted to be back here on A Reluctant Foodie doing another guest post for Al. Our last challenge (Stuffed Peppers) was such fun that we decided to do it again and this time I suggested 'Balls"! In fact, I had no trouble at all deciding which 'balls' I was going to make, it was inevitable. I am half Swedish and I was brought up in a house where certain Swedish foods were regulars at our table. I was aware of Ikea and their meatballs before the rest of the world began their love affair with them. My Mormor (Grandma) used to make them fresh and serve them with dollops of sweet lingon berry sauce, boiled potatoes and delicious creamy gravy. I remember how she would break up my potatoes for me and then pour over the sauce and mix it in....it was heavenly. Even Ikea's processed meatballs are pretty darn good. I don't think I have ever met anyone who doesn't know of them and in fact, love them! Doesn't everyone who shops at Ikea stop for a plate of their Swedish meatballs? They make the whole nightmare experience so much more acceptable, if even just for a few minutes. My kids gobble them up as though they were chocolate not meat. My homemade meatballs really do taste like Ikea meatballs, just much better! Swedish meatballs are superior to all other meatballs in my opinion. They have a lighter texture...not too dense or crumbly. They are simply seasoned so that the quality of the meat remains the main flavor. And to top it all off, they are called 'kottbullar' (pronounced "shurt bullar') *she childishly giggles again*! The key to these balls is two fold. 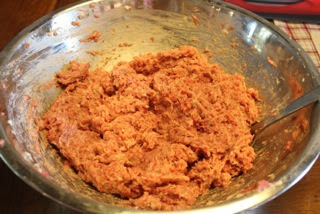 Firstly, the meat is a mixture of 70% beef and 30% pork - good quality mince. I got mine from the local butcher, no scrimping. (My Mormor would also add some chicken liver for a really luxurious meatball. Secondly, to achieve the lightness, quite a lot of breadcrumbs soaked in milk and cream are added to the meat before shaping into balls. 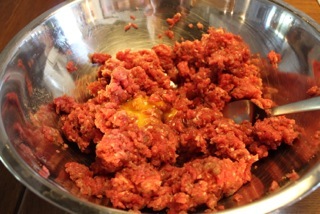 This makes the mince quite wet and loose in texture. It might seem a bit strange butstick with it, the end result is unlike the usual stodgy balls you may be used to . My daughter was 4 years old on December 23rd and I decided to make my meatballs for her birthday party. Definitely something that kids enjoy and adults alike. I decided to serve them as a little nibble to pass around during the festivities with some dips. My recipe makes 40+ meatballs so plenty for everyone or enough to make a substantial meal for the family to serve with sides. First of all, you soak your breadcrumbs in the milk and cream and leave for 10 minutes. Meanwhile, in a large bowl, add to the two types of mince, the salt, pepper, and sugar and give it all a good mix. Then stir in the onion and egg. Next you need to add the breadcrumbs and milk. Do this a little at a time, mixing in as you go. You may find you do not want to add all the milky mix but do try to add as much as you can. It will make the mince quite wet but not sloppy, much wetter than perhaps you would when making meatballs but that's what makes these so special. Next. 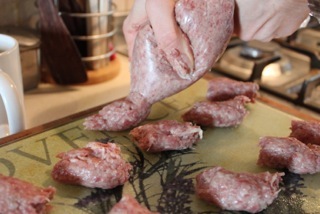 to make the balls, wet your hands with a little cold water which will help the meat not stick to much. But if you want to get a nice uniform sized meatball, you could pipe the meat into little portions and then roll. It really does work and you will find yourself with much more even little balls. You want them to be quite small...not quite as big as a golf ball. 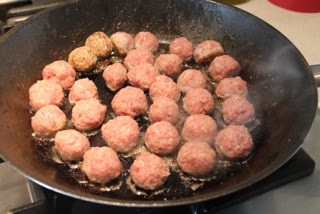 Then melt a good knob of butter and a little of the olive oil in a pan and start to fry your meatballs. Do them in batches so as not to overcrowd the pan, adding a little more butter and oil each time. Shake the pan around every so often to allow the balls to bump around and keep their roundness rather than be flat on one side. They take about 10 minutes to cook. Remove and keep warm until you have all your balls done. I made my meatballs in the morning and then just reheated them in the oven for 15 minutes at 180C just before serving. As I said, you can serve them in many ways. As a nibble with some dips - I used BBQ, Ketchup and a spicy Spanish sauce. Or along side chips or mashed potatoes with a creamy gravy and Lingon if you can get it. You could also add them to a pasta sauce. Anything you like really - they are delicious and versatile. Any way you have them, they will be gobbled up in minutes.....no one can resist the power of the Swedish meatball! 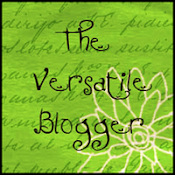 I just wanted to say thanks again to Al for having me come and guest post! Always a pleasure and hopefully it's becoming a regular thing! Please come over to www.delicieux.eu and check out Al's guest post also featuring some amazing balls!! Biog: I am a Private Chef living in South West France. I am a 36 year old mother of two, living the rural dream. I love to cook all food and am inspired by fresh produce and the cuisine here in France. From rustic traditional dishes to vegetarian fine dining, I try to cook it all and share my journey with you. Stop by and check it out! You're welcome! I think these "battles" have added a really fun element to blogging for me and I'm certainly up for more whenever it works for you. It's wonderful to see Anneli guest posting here again, Al - such a fun swap of recipes! I love Swedish meatballs and it's been a long time since I've had them. And I never realized Ikea sold/served them - I'm going to have to look for them the next time I visit an Ikea... Thanks so much for sharing! I didn't realise you were half Swedish Anneli! 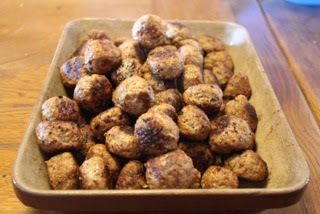 I am soooo going to make these authentic balls and like you they're one of the only reasons I brave a trip to Ikea! Any ideas of what to put in the creamy gravy? I want to do the full Ikea experience at home! Obviously without having to spend a small fortune on totally unnecessary kitchen and household nic nacs that rarely get put up or used!